You already love the internet. Love your router too. The AC750 Wi-Fi Router comes in four different colors and is powerful enough to let you surf the web, play games and stream HD movies – all at the same time. Next Generation AC750 Technology Increased speed, range, and reliability ensure coverage throughout your home. 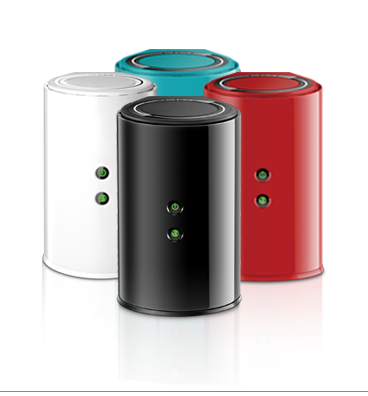 Works with existing and future Wi-Fi devices. Faster speeds with less Wi-Fi interference for maximum throughput. 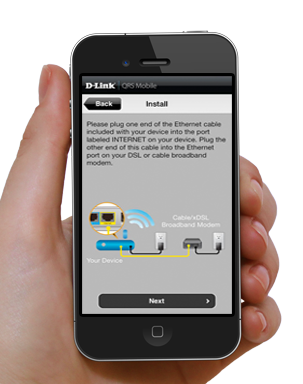 Remotely monitor your network using your smartphone or tablet. Four Gigabit LAN ports deliver high-speed wired connectivity giving you a seamless networking experience. Get more total bandwidth, less congestion and better overall performance when you have multiple users accessing the same network. AC Wi-Fi is Fast. Really, Really Fast. AC means doing what you love on all your devices. Watch a movie. Game without lag. Upload pictures of your cat. Whatever you’re into, AC Wi-Fi has your back. Less Wireless Interference. More Internet Happiness. 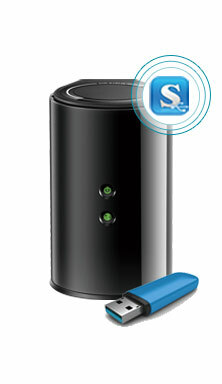 A dual band router gives you two wireless networks in one. Use the 2.4 GHz band for everyday internet activities like viewing photos and checking email. The clearer 5GHz is for more intensive activities like HD movies and gaming. Less wireless congestion means you can do more on your network, all at the same time. Access your content from anywhere. 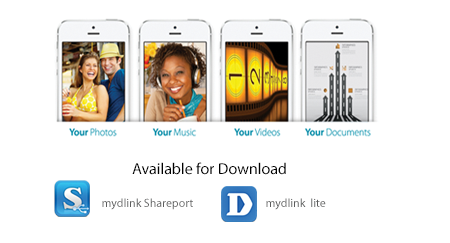 Save your photos, music, videos, and documents to a USB drive and connect it to your router for instant access — anywhere, anytime, any device — with the free mydlink SharePort app. Be in charge and decide what your kids can view on your home network. Our QRS app allows for ridiculously easy push button setup. It’s hassle-free and gets you online fast. Maximum wireless signal rate derived from draft IEEE 802.11ac and IEEE 802.11n specifications. Actual data throughput will vary. Network conditions and environmental factors, including volume of network traffic, building materials and construction, and network overhead, lower actual data throughput rate. Environmental factors will adversely affect wireless signal range. Wireless range and speed rates are D-Link relative performance measurements based on the wireless range and speed rates of a standard wireless product from D-Link. Maximum throughput based on D-Link 802.11ac devices. The site where you install the Switch may greatly affect its performance. Please follow these guidelines for setting up the Switch. • Install the Switch on a sturdy, level surface that can support at least 3 kg (6.6 lbs.) of weight. Do not place heavy objects on the Switch. • The power outlet should be within 1.82 meters (6 feet) of the Switch. • Visually inspect the power cord and see that it is fully secured to the AC power port. • Make sure that there is adequate space for proper heat dissipation from and adequate ventilation around the Switch. Leave at least 10 cm (4 inches) of space at the front and rear of the Switch for ventilation. • Install the Switch in a fairly cool and dry place for the acceptable temperature and humidity operating ranges. • Install the Switch in a site free from strong electromagnetic field generators (such as motors), vibration, dust, and direct exposure to sunlight. 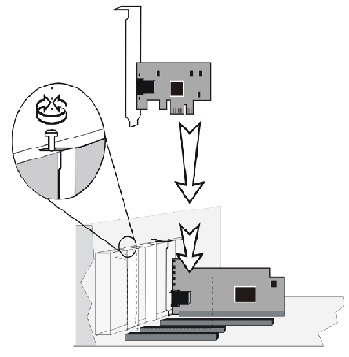 • When installing the Switch on a level surface, attach the rubber feet to the bottom of the device. The rubber feet cushion the Switch, protect the casing from scratches, and prevent it from scratching other surfaces. 1. Mount the Nylon screw anchors into a cement wall. 2. Drive the T3 x 15L screws into the Nylon screw anchors. 3. Hook the mounting holes of the switch back on the screws. End nodes include PCs outfitted with a 10, 100, or 1000 Mbps RJ-45 Ethernet Network Interface Card (NIC) and most routers. An end node can be connected to the Switch via a twisted-pair Category 3, 4, 5, or 5e UTP/STP cable. The end node can be connected to any of the ports of the Switch. The Link/Act LEDs for each UTP port light green when the link is valid. The LED over the port label indicates a port speed of either 10/100 Mbps or 1000Mbps. A blinking LED on the bottom indicates packet activity on that port. These connections can be accomplished in a number of ways using a standard Ethernet cable. • A 10BASE-T hub or switch can be connected to the Switch via a twisted-pair Category 3, 4, 5, or 5e UTP/STP cable. • A 100BASE-T hub or switch can be connected to the Switch via a twisted -pair Category 5 UTP/STP cable. • A 1000BASE-T switch can be connected to the Switch via a twisted -pair Category 5e or better UTP/STP cable. Any of the five Gigabit Ethernet ports are ideal for uplinking to a network backbone or network server. 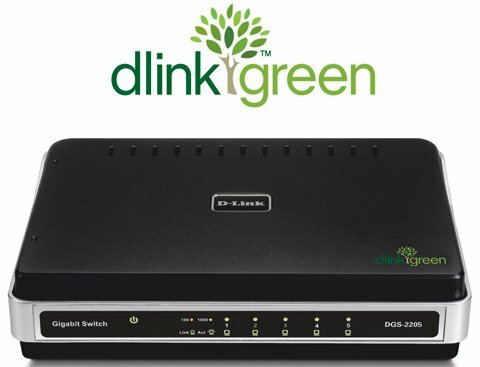 ●Why can´t I share my Internet connection to multiple computers when using my D-Link DGS-2205 switch? 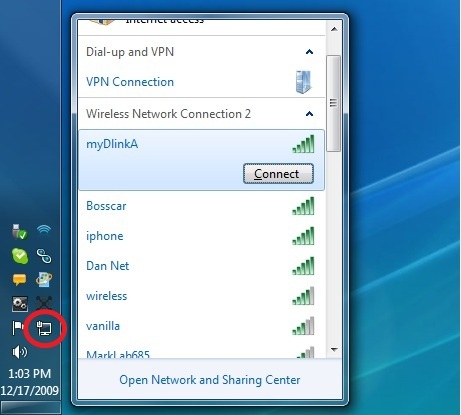 If you are connecting directly to a Cable or DSL modem, you will need a router to “share” your Internet connection or a computer using ICS (Internet Connection Sharing) or Proxy. Switches and hubs do not allow you to share a single IP address to multiple computers. Another alternative is to contact your ISP and purchase extra IP addresses for each additional computer. ●Does the DGS-2205 switch have an uplink port? The DGS-2205 has Auto-MDI ports which automatically sense the type of cable being used (e.g. Crossover or Straight-through) and adjust themselves accordingly to pass data over the network. ●What is the maximum length of Category 3, 4 or 5 twisted pair cable that can be used between the DGS-2205 and other devices such as routers, switches, computers, etc.? The maximum length of Category 3, 4 or 5 twisted pair cable that can be used between computers and other devices on a network is 100 meters or about 328 feet. Keep in mind that this is a theoretical limit. Usually, you will want to keep the distance between devices well below the limit. Why can´t I share my Internet connection to multiple computers when using my D-Link DGS-2205 switch? 2. Does the DGS-2205 switch have an uplink port? 3. What is the maximum length of Category 3, 4 or 5 twisted pair cable that can be used between the DGS-2205 and other devices such as routers, switches, computers, etc.? 1. Shut down the computer and unplug the power cord. 2. Remove the chassis cover. If you are installing a network adapter in a tower computer, we recommend to put the computer on its side in order to be able to apply the correct force to insert the adapter into the PCI Express slot. 3. Locate an empty PCI Express slot on the motherboard. 4. Insert the network adapter into the PCI Express slot and push it down vertically into the slot until it is firmly seated. 5. Install the bracket screw to secure the network adapter to the computer chassis. 6. Replace the computer chassis cover. Reconnect the power and switch the computer power on. 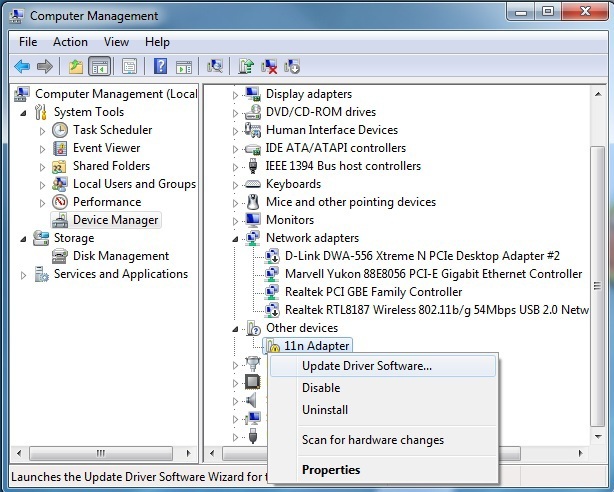 If the BIOS section of your computer’s boot program is plug-and-play compliant, then at power-up the BIOS will automatically configure any newly installed adapter. Refer to page 16 in the manual for instructions to verify your installation. First you can get a Gigabit connection link. A common problem when connecting different gigabit devices is Auto-sensing between the two different ports. When connecting two Gigabit devices it is imperative that the port speed be set the same on both sides. Some Managed Gigabit products have the ability to have the port speed set at either 1000Mbps/Full duplex or Auto. Other Un-Managed products don’t have the ability to modify the port speed at all. If you are using an Unmanaged device, or a device that doesn’t have the ability to set the port speed at 1000Mbps/Full duplex, you may not be able to connect to a device whose port speed is set to 1000Mbps/Full duplex. If the link speed is not 1.0 Gbps, then the cabling between the two endpoints should be examined. If using Gigabit over Copper (1000 Base-T) than you can use Ethernet cable Cat 5 or better (Cat5E, Cat6 or Cat6E). If the cable is pinned improperly, than the network connection will not run at gigabit speeds. Gigabit over copper uses all 8 wires of the Ethernet cable. If you are using a store bought/factory pinned cable, and the connection speed is still not connecting at 1.0 Gbps, there may be a bent/broken pin on either the NIC, or the switch port. 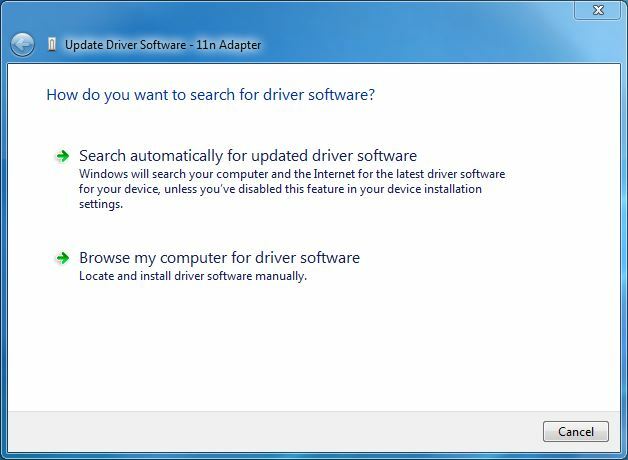 Isolate each portion of the possible problem, until you are able to find the defective port on the network. This can be done by using known good gigabit ports, and cabling. How do I uplink to another hub or switch? You can always connect an Ethernet hub/switch to another hub/switch. Some hubs/switches have uplink ports, and others do not. The configuration for all scenarios is listed below. Note: These examples are for 10/100 hubs and switches. Gigabit switches and NICs will always use a straight through Ethernet cable when connecting two devices together. There is no such thing as an uplink Gigabit port, or a crossover Gigabit cable. 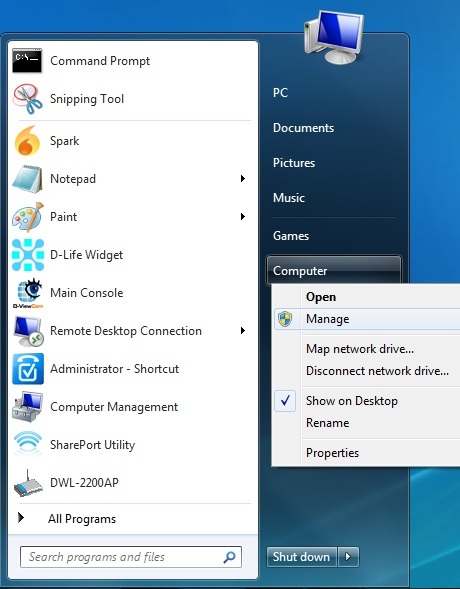 Step 1: Use an Ethernet cable and plug your computer directly to your Internet gateway. Make sure Internet is accessible. 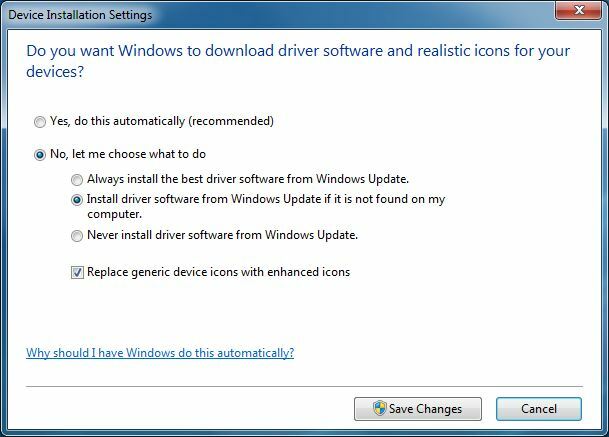 But if the message no longer appears, skip to Device Manager Installation.